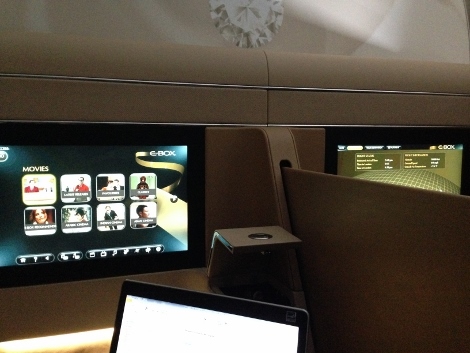 Etihad has just announced a new first, business and economy seating on its A380 and B787-9 aircraft being delivered in 2014. For that story, click here. 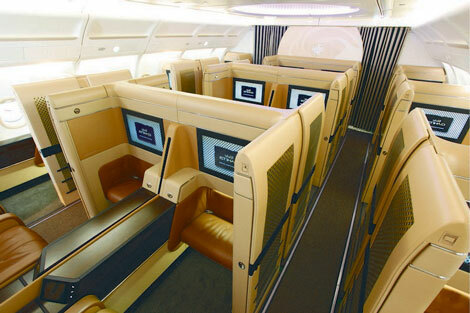 This review is of the current first class available on the carrier’s A340-600 and B777. I arrived at 1100 for my 1335 departure on EY17. A chauffeur drive car had picked me up from Dubai, and made the one hour drive to Abu Dhabi International airport. Once there an Etihad porter in smart livery insisted on taking my bag on a trolley and walking me to check-in, where there was no queue and I was quickly checked in. From here you walk straight to immigration, a cursory check of carry-on bags (laptop stayed in laptop bag, although my belt had to be removed) and then I was airside. This is accessed immediately after security, so instead of having to walk through a shopping mall as at most airports, you take about ten steps, get into a lift and are there. The first and business class lounges are separate. Each lounge has its own Six Senses spas, with a good range of treatments. 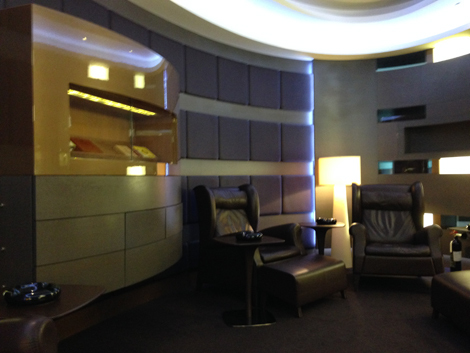 At this time of the day the lounges were almost empty and being cleaned and hoovered after the morning rush. The last time I passed through in November of last year I was in the early hours of the morning, one of the busy times, but now I had the choice of seats. I sat down at one of the computer stations and started to work on my laptop, and was immediately asked what I’d like to drink, including Champagne, and offered the lunch menu. I knew I was eating on-board, and so just had a cappuccino. The lounge isn’t large, but has lots of different areas including a restaurant, the Six Senses Spa, a work area, comfortable sitting area looking with windows and also a central cigar room where complimentary cigars are available. I love a cigar and if it had been a little later I would have had a large lunch in the restaurant, stretched back in the cigar room with a Cohiba and not minded missing my flight, but it was not to be, so instead I worked. I walked to gate 32 at 1240 before the flight was called (this is done by the staff walking round and telling you it’s time to go rather than over a loudspeaker), and joined the priority queue for business and first. Once through there was a two-minute wait and then the plane stared to board with premium passengers given priority. I walked down the air bridge and saw there were two joined to the aircraft, with one dedicated to Diamond First (the big advantage being that once you sit down you don’t have other passengers walking onto the aircraft past you). I was greeted at the aircraft door and directed to the far side of the aircraft. I sat down but then when a passenger followed me realised I must be in the wrong seat (I had sat in 1K instead of 1D). I should have known, but you go where you are directed sometimes. I went back to the galley flight attendant and this time she walked me to the correct aisle and the correct seat. Once there I was offered a newspaper and a drink. I chose carrot juice which took quite some time, but the on-board chef introduced himself after a few minutes, apologised for the delay and said it was being freshly squeezed. In the meantime they brought orange juice in a champagne flute. In fact it took nearly 20 minutes for the carrot juice to arrive, after the doors had shut, but I was impressed they didn’t give up on the order. 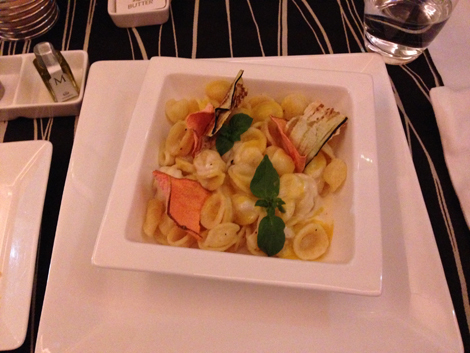 At the seat were the menus, and later a sleep suit and amenity bag was brought. In the amenity bag were Bergamote 22 products including lip balm, moisturiser and hand cream. On the A340-600 there are nine first suites in a 1-2-1 configuration (A – DG – K). To see a seat map, click here. The suite is cream and tan in colour with the actual seat being in a tan-coloured Poltrona Frau leather. The suite doors have the gold, diamond-shaped screen (mashrabiya) allowing some light to come through but giving privacy without feeling claustrophobic. The seat is spacious, and 29.8 inches (75.7cm) wide, and 80.5 inches long (204cm) when reclined into a fully-flat bed. There is a footrest which can also act as a second seat allowing dining together, although I can’t imagine many people do that. There is also a very thin wardrobe, you can just about hang a suit in it. I last flew this seat back in 2009, not long after it had been introduced (click here for the review), and we also have a review of the first class on the B777-300ER (same suite) here. 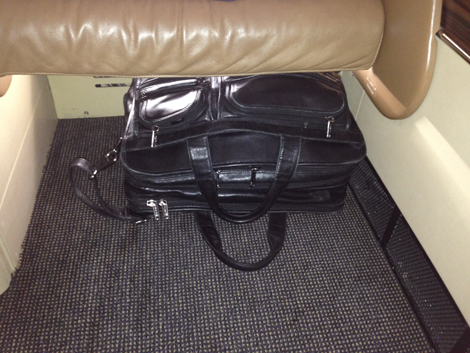 There’s a good amount of storage around the seat, and my bulky laptop bag fitted under the seat in front. None of the seats have overhead storage – so bags are stored up front in a wardrobe or under the ottoman seat for smaller items. The table is huge, it comes out on the side of the suite and then folds out. It is rock solid for eating and drinking. Touchscreen controls are also built into the right hand side of the suite, with controls for the lighting, a privacy button, and three different buttons for adjusting the lighting. You can change the seat’s angle simply by selecting the picture of the seat in the position you want it to be in – be it upright, fully-flat, or for dining. The seat has a number of presets, and the dining one lowers the armrests and glides the seat forwards towards the table. The table can be moved forwards or backwards. The IFE selection is extensive, with films, TV programmes and audio, though the system is slower to respond than on the B777-300ER so perhaps is an older version, and there is no Live TV such as we had on that aircraft. The noise-cancelling headphones were very good. If you are travelling with a friend or relative, I’d choose the centre seats, but otherwise avoid them – although there is a centre divider it still means you are quite close to the person in that seat, and when you’re both sitting up eating or working it’s very easy to make eye contact inadvertently. Also with the doors shut it feels like instead of having privacy you’ve been shut in together – only psychological, of course, but quite strange. To give one example, while I was watching my film I could see how long there was remaining of the flight simply by looking at the next door seat’s screen for estimated arrival time in London. In addition, if that passenger turns on their light, then on certain settings – and there are several – it can disturb you. Lastly if they press the wrong button then the divider comes down altogether, which is something I accidentally did, though quickly remedied it. So, go for a window seat, and preferably not one in the front row since the food is prepared in the galleys at front. If I had a choice I’d go for 2K since it’s in the middle, and the washroom on that side is larger – easier to get changed. I was impressed that as we taxied out for take-off the flight attendants came round and politely insisted that passengers who had ignored the instructions to turn off their mobile phones did so. Also worth noting was that the flight attendant who’d misdirected me came and apologised after take-off. The chef then apologised for the carrot juice taking so long and asked if I wanted some more, so I was beginning to feel guilty, especially since I didn’t want any more carrot juice. I said I didn’t, but instead asked if I could have some English breakfast tea with milk. This came quickly, but with a side order of mint leaves instead of the milk. I asked the flight attendant (a different one this time) for milk and was told that the chef had said I’d asked for mint. I said maybe he meant milk. No he didn’t, I was told, he said mint. Well, in any case, I said, could I have milk with my tea? And this was brought. The flight was extremely bumpy for the first couple of hours, and the captain kept us informed of his various attempts to avoid this, but the net result was that the seatbelt sign was on for nearly two hours, and on at least two occasions service stopped throughout the aircraft for the safety of the flight attendants who were instructed to sit down. During this time we were not allowed to use the washrooms, and I regretted having had the orange juice, carrot juice and tea. veal jus, Bearnaise sauce, tomato concasse, Café de Paris butter. Crisps, cookies and madelaines, Swedish crisp breads. Both of which were very tasty. Others chose to dine later because they had already dozed off or weren’t hungry. After that I decided to sleep and so the bed was made up for me. This is quite an operation, taking a few minutes since there is a cover blanket, new pillow, duvet and the bed fully reclines, though the result is a long and totally flat bed. When I lay down I was given the option of having the doors shut, which I took. I’m not sure how much difference this really makes – most first class seats (or suites if you prefer) have privacy designed into them so you don’t have to meet other passengers’ eyes. I understand if it’s a cultural thing for women travelling, but from my point of view it’s a little fiddly opening and shutting them, especially since I never found the automatic button so had to pull them open, something that’s quite difficult to do when you’re lying down. I see Air France is opting for a curtain in its new first class. The staff were very good, always willing to help though I think the sheer range of options in first from the food and drink through to when you want to eat it and how, and the ability to have the bed made up or not and so on baffles the passengers and also makes it difficult for service to seem effortless. My fellow passenger across the aisle was on the flight because his previous one (with another airline) had been cancelled, and although obviously a regular flyer, was likewise a little bemused by all the information being conveyed to him, especially since he was exhausted. 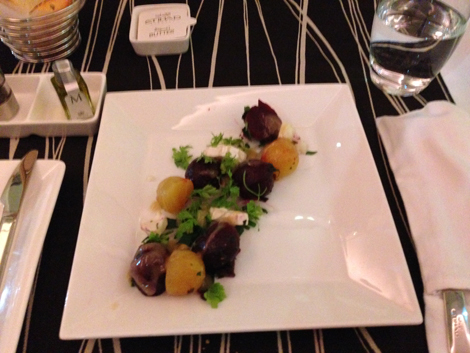 Still, as an example of how good they were, one hour before landing I asked for a Garden Salad from the anytime menu and they prepared it and quickly served it. We got to Heathrow on time, but then circled for a good 20 minutes before landing at 1820. There was a fairly long taxi, and then we arrived at our gate in Terminal 4. There was no queue at immigration, and the first bags were being off loaded by a porter. I then went through customs, and could have used an Etihad chauffeur car to take me home. (In fact I used a local taxi). Good. The food and drink selection is excellent, and the bed, and the way it is made up, make for a good night’s sleep if needed. The seat is five years old now, but has aged well, particularly the leather. The service was attentive, especially bearing in mind the frequent interruptions because of turbulence.